Starting things off on my shiny new blog with one of my favourite places for lunch. The Caffeine Drip is a South African cafe and bakery located in the West End of Edinburgh on Melville Place. It is the first place I suggest for lunch because the menu has the perfect combination of indulgent treats and healthy wholesome plates – and I'm always tempted between the two. 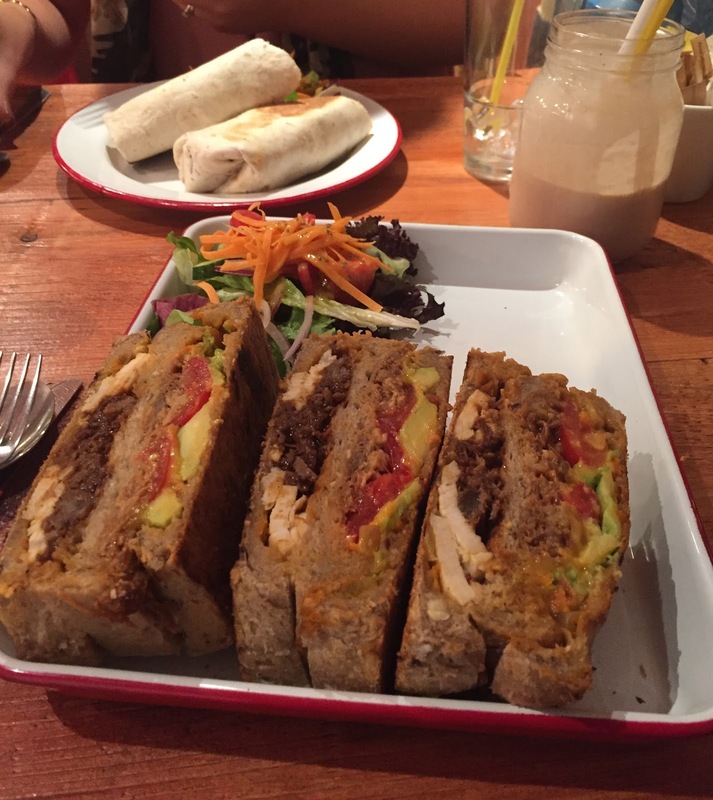 Their club sandwiches are unexpectedly indulgent – they are absolutely huge. The Killer Club is packed full with grilled chicken, cheddar, tomatoes and pulled pork covered in a unique spicy pickled vegetable sauce called Chakalaka. I'm not exaggerating when I say that I had this one day for lunch and was not remotely hungry come dinner time, it is not for the faint hearted! On the lighter side they always have a few soup options which you can pair with a flat bread, panini, wrap or even one of their boerewors rolls (I will definitely be back soon to try one of the boerie rolls!). 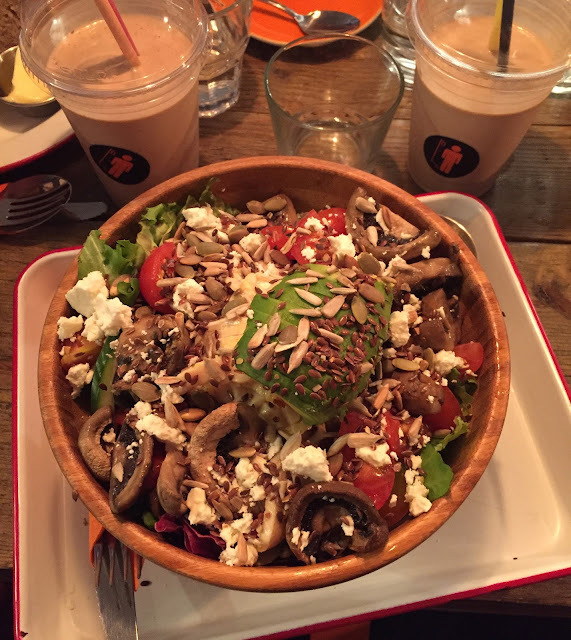 They also have the absolute best salad I have ever had in a cafe. Now, I'm not one for ordering salads when I'm out. In terms of my at home cooking, I eat a lot of salads. I have the combinations I know and love, and feel like I can make a pretty impressive salad myself. Plus, people insist on putting tomatoes in salads and let's just say I'm not a fan. Plus, if I'm going out for a meal, I don't want something light like a salad, I want to indulge! But when I saw a pic on Instagram of the Honey Mustard Chicken salad I just had to try it – and I was far from disappointed. This salad has everything I love (except those damn tomatoes, but they are easy to pick out and donate generously to a pal) chicken, feta cheese, roasted mushrooms, avocado, cucumber, roasted seeds and a tangy honey mustard dressing. I could not recommend this dish enough, plus you get a massive portion so you're getting a lot for your money. Their breakfast menu is equally as exciting as their lunch menu. They have delicious french toast which comes as either a savoury or sweet dish. The sweet is sprinkled with cinnamon while the savoury is covered in cheese – what's not to love there? They also have a great create your own breakfast option, including an entire section for vegans! Their drinks menu is on point including a line of premium hot chocolates you won't see elsewhere. The Knysha Delight comes in a choice of dark or white chocolate with peanut butter, cream, peanut butter cups and chocolate sauce is incredible. They also have my absolute favourite milkshakes in the city. You pick from a few base flavours, combine it with anything from oreo cookies to jaffa cakes then add the toppings you like! They are super thick and creamy and packed full of flavour. My personal favourite is a banana and nutella milkshake. I've been quite a few times now and the service is always great, even on a busy Sunday. You have to go up to the counter to order, but once you do you don't have to wait too long for your drinks and food. They also have a delicious looking selection of cakes and tray bakes around the counter – if you've left room for dessert! My only complaint is how good the menu is, I can never decide what I want to order!